HED International Introduces Bell Plus Kilns! UNIQUE/PERENY’s high temperature Bell Plus Kilns are designed for temperatures up to 1800°C (3272°F) with capacities from 50 to 1000 cubic feet. The fuel efficient design utilizes waste heat from kiln exhaust gases which pass through a convection type recuperator to preheat combustion air up to 1000°F. The preheated combustion air is conveyed through insulated pipe to high velocity burners that fire into lane arrangements designed to uniformly transfer heat throughout the product setting space. Each Burner provides optimum performance with separate zone control and high turn down capability. 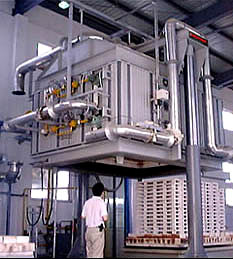 Required kiln atmospheres are achieved by digital control of air/gas ratios through the proprietary, mass flow, combustion system. UNIQUE/PERENY’s HMI control system software and PLC allow for programming and data logging from a remote PC. The structure of the Bell Plus Kiln is similar to UNIQUE/PERENY’s successful Top Gun Elevator Series, with 15″ thick, interlocking refractory walls contained in a heavy duty, structural steel shell. Additional Bell Plus features include; pressure control, water cooling, recuperation and various combustion systems such as pulse, proportional or combination. The Bell Plus Kiln introduces the ultimate technology available in combustion and control systems while still maintaining the robust structural and refractory designs that have been time proven for high temperature firing. The UNIQUE/PERENY recuperation system improves firing efficiency and can reduce fuel consumption up to 20%.